Have you booked your ticket yet on Southwest Airlines upcoming flights from Tampa International Airport to Havana? How about your Royal Caribbean cruise to Cuba aboard the Empress of the Seas, which will leave from Tampa Bay starting in June? While South Florida usually gets all the attention when the subject of Cuba comes up, Tampa Bay&apos;s relationship with Cuba goes back to the 1880s. Tampa Bay had ties to Cuban before Miami even had people! Southwest flew its inaugural trip to Cuba December 16. The flights leave TIA at 6:30 a.m. and return about 12 hours later, arriving in Tampa at 7:25 p.m. -- making a run to Havana a day-trip option for a Tampa Bay vacation. Before you go, you can get a preview of Cuban culture right outside the airport&apos;s gates in Tampa Bay. Our Latin Quarter, Ybor City, was founded by Cuban exile Vicente Martinez Ybor, who moved his cigar business there in the 1880s. In the following decades, Tampa Bay became a magnet for Cubans, building strong social and commercial connections between the two communities. Today&apos;s brick streets, iron balconies and strong cafe con leche hark back to those earlier days. Cuban torcedores still roll hand-made cigars along Seventh Avenue (La Septima) as they did when Tampa Bay produced millions of cigars using tobacco leaf grown in Cuba, making us the Cigar Capital of the World. Florida&apos;s first commercial brewery opened in Ybor City in 1897, shipping much of what it produced to thirsty Cubanos. The world famous Cuban sandwich has developed many permutations over more than a century. But the original was invented here at Ybor City&apos;s El Pasaje building to feed all those Cuban cigar workers. Vicente Martinez Ybor himself approved the final recipe. 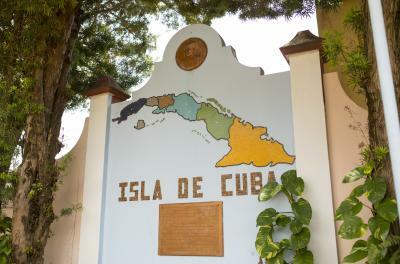 For 53 years, the only piece of Cuban-owned US soil stood in a quiet corner of Ybor City. Jose Marti Park -- still officially international soil -- commemorates the connection between Marti and Tampa Bay. The Cuban poet and freedom fighter found support for his revolution against the Spanish Empire among Ybor City&apos;s thousands of cigar workers. Marti survived an assassination attempt in Ybor City and recovered with the help of local supporters. Striking silver minarets making downtown&apos;s former Tampa Bay Hotel and local icon. Now part of the University of Tampa, the historic moorish-inspired building was the headquarters for the US military in the run-up to the Spanish-American War, which ultimately freed Cuban from Spanish rule. The invasion of Cuba launched from the Port of Tampa. Then-Lt. Col. Teddy Roosevelt&apos;s Rough Riders left an indelible impression on Tampa Bay. They even have a local social club and charitable group named after them. So before jetting off to Havana, give yourself some time to sample Cuban right here in the US of A -- in Tampa Bay.